All three on letterhead of The Deanery, Westminster, S.W.' Two from 18 October 1897, the other from 25 October 1897. The three items are in good condition, ondff lightly aged and worn. Three interesting items, responding tactfully to what would appear to be an accusatory communication by Harington, pointing out that his son has succeeded despite having been 'superannuated' from Westminster School. ONE: 18 October 1898. 4pp., 12mo. Begins: 'Dear Sir Richard Harington | I am delighted to read the two enclosures. The Winnington-Ingrams one associated with many memories of my Rugby, Marlborough, & later days!' He will send the enclosures to the Head Master, [b]ut I won't rebuke him or convey any rebuke. [ P. C. Joshi, Ben Bradley and Mohan Kumaranangalam, communists. ] Duplicated Typescript of the article by P. C. Joshi titled 'In Our Country - Among the People'. Duplicated typescript headed: 'From Airgraph to Ben Bradley from Mohan Kumaranangalam. 18th January. [ no year ]'. The article said to be from 'People's War [ magazine of the Communist Party of India ], Vol. iii, No. 30, Sunday, 21st. Jan. 194'. 12pp., folio. On twelve leaves of air mail paper. In fair condition, aged and worn. The piece begins with a discussion of 'Two big events' that have occurred during the previous year, 'when it appeared as if the period of deadlock was about to end and a new era to begin. | The first was Gandhiji's release [...] Soon after came the second big event; the Gandhi-Jinnah meeting'. [ Bradley & Son, Ltd., Reading printers ('The Crown Press'). ] Eight printed items (Wayzgoose and dinner invitations, illustrated publicity brochure, articles of association) and sixteen photographs illustrating the various departments of the works. Bradley & Son, Ltd., The Crown Press, Reading. 1910 to 1937. 24 items, 21 of which are in good condition, lightly aged and worn, but with two of the photographs curling at head, and a magazine (described below) dog-eared and creased. Of the printed items, the first seven are produced in elegant style by the firm itself, and comprise: 'Memorandum and Articles of Association of Bradley & Son, Limited. [ Robert Simson, Scottish mathematician. ] Autograph Letter Signed ('Rob: Simson') to unnamed recipient, regarding the shipping of 'Fifty four English Euclids Small paper', and the transit of Venus. [ Lillian Trimble Bradley, American playwright. ] Corrected Typescript of unpublished play 'Out Goes She [ originally 'One, Two, Three!' ] | A Comedy | In Three Acts'. Without place [ New York City? ]. Undated [ circa 1928 ]. 135pp., 4to. Lacking last page or pages. Typescript on rectos only. Bound with string and metal stud. Aged and worn, with front cover (with typed label) and title-leaf detached. Original typed title 'ONE, TWO, THREE! ', altered in manuscript to 'ONE! TWO! THREE! (under which it was registered for copyright in 1928), with final title in autograph 'OUT GOES SHE'. Manuscript emendations throughout in pen and pencil, including additional dialogue and several deletions. [Printed pamphlet.] Suggestions to Teachers of English in the Secondary Schools. Berkeley: Published by the University [of California]. 1894. 68pp., 12mo. In grey printed wraps. In good condition, on lightly-aged paper, with shelfmark, stamp and labels of the Education Department Reference Library, London. Scarce. [In illustrated wraps.] Medley! By Cuthbert Bede, B.A. Author of "Motley;" "Verdant Green;" &c &c.
London: James Blackwood, Paternoster Row. 1856. 114pp., 12mo. In wraps printed in green and red, with striking illustration of jester bursting through the front cover, and advertisements on the rear. In fair condition, on aged paper, in worn wraps. Frontispiece, engraved title, and numerous illustrations in text. A collection of nineteen pieces in prose and verse, with such titles as 'A Chat concerning a Couple of Chairs' and 'Mephistophiles at Malvern'. Scarce: the only copies on COPAC at the British Library and Durham. 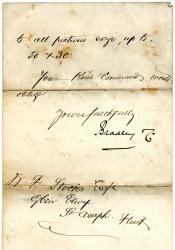 Autograph Signature ('Edward Bradley') on portion of letter to Lady Huntly. Text on both sides of a piece of paper 6 x 11 cm. Fair, on lightly-aged paper, with a couple of glue marks from previous mounting on reverse. 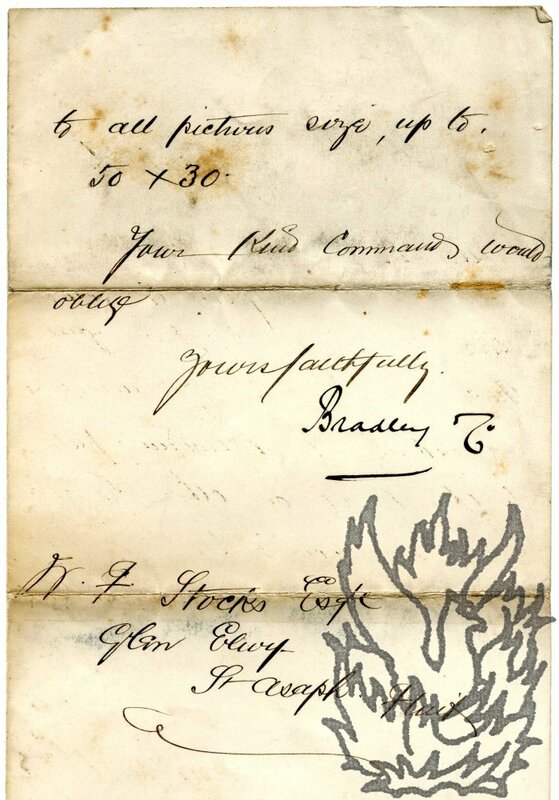 The bottom part of the letter, cut away for the signature. Side with signature reads '<...> yet heard from the Bp. of Petebro on that point. I have to write hastily for our 3.45 post. | Believe me dear Lady Huntly yours very sincerely obliged | [signed] Edward Bradley'. Reverse reads '<...> of the Dining room and Study - & some of the bedrooms - and also paint the whole of the outside of the house. Four Autograph Letters Signed ('W. Marshall') to Messrs Bradley & Son Ltd[, The Crown Press, Printers, Caxton Road, Reading], giving formula for 'Spacine' ('for the prevention of rising spaces in Monotype') and instructions for its application. 30 Jan. , 8 and 13 May 1929 and undated; the first three from 92 Upland Rd, East Dulwich, London, S.E.22. The four items, all on aged and lightly spotted paper, are attached by four rusty staples. One (five pages, octavo): In reply to the firm's inquiry regarding 'the prevention of rising spaces in Monotype', Marshall states that, instead of giving information, he 'would rather send you the method and you try it out and prove for yourself its value, then pay me afterwards'.